Show of hands if you’re still wiping tears from your eyes after last Sunday’s episode. 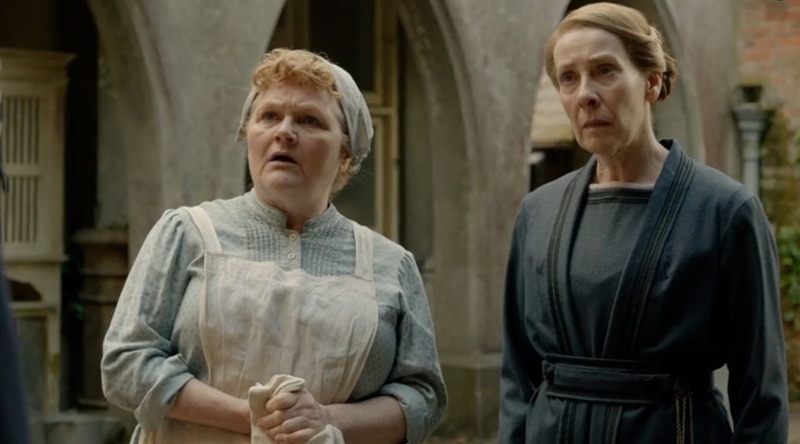 And another show of hands if you’re still chuckling over Mrs. Patmore’s House of Ill Repute. 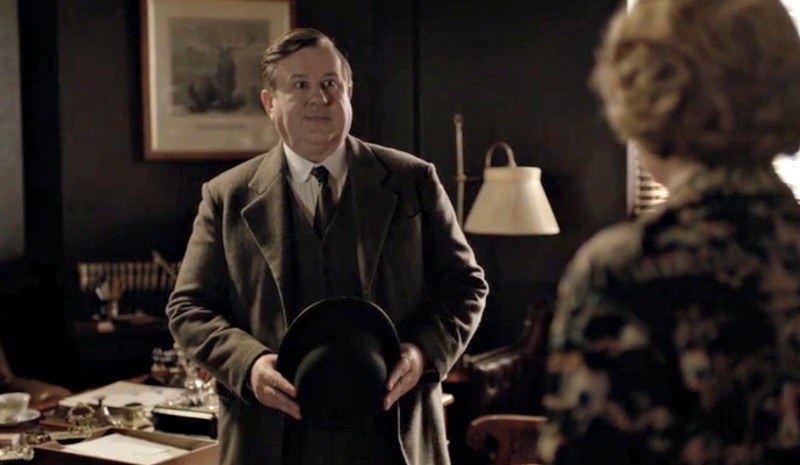 Or Spratt’s double life as an advice columnist. 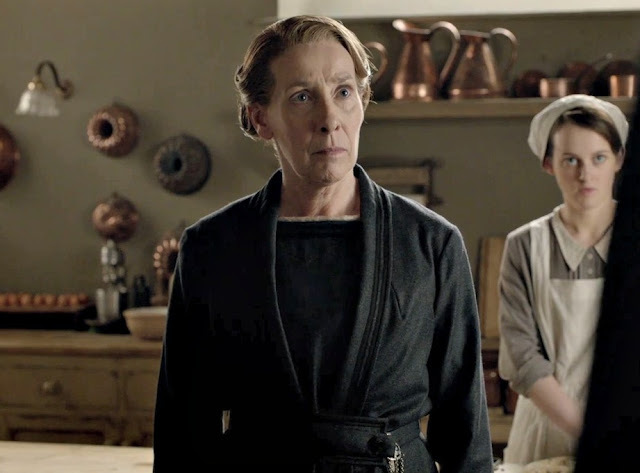 This week’s episode was probably one of my all-time favorites and will go down in Downton history as one of the most tragic, head-turning, I-sure-didn’t-see-that-coming episodes ever. Well, except for the now infamous Robert ralphing blood scene, which I shall never forget for as long as I live. What fun! So this week sure ran us through the gamut of emotions, didn’t it? I think, in honor of this swaying emotional episode, I’ll choose my Top Five lines from the emotions they elicited. I’m living on the edge, I know, but bear with me. Robert could hardly contain himself when he found out that Edith’s beau, Bertie, was no mere estate agent. 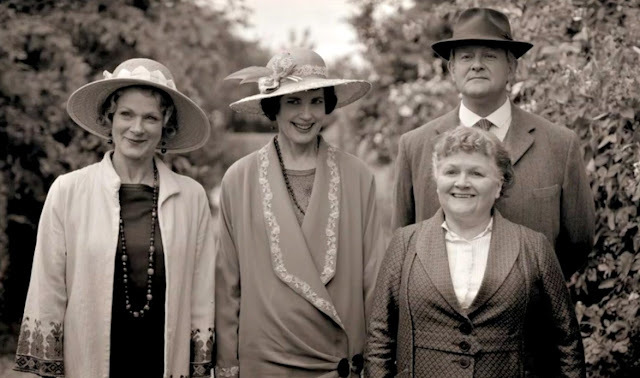 No, Bertie had a secret, which, because he is such a paragon of virtue, he had shared with Edith, but which Edith, somewhat a lesser paragon than her boyfriend, had kept to herself. Bertie’s secret came out this week. He was the heir to his second-cousin-twice-removed’s estate—the one at which he worked as a lowly agent prior to his cousin’s untimely death. At which point Bertie became the Marquess of Somewhere. 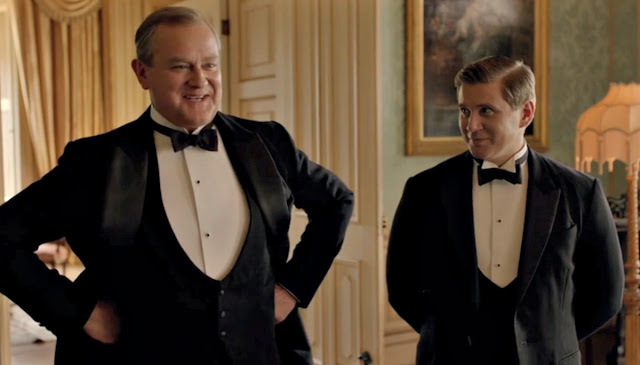 Robert knew the implications of having a Marquess in the family. Clearly. Golly Gumdrops!! What a turnup!! 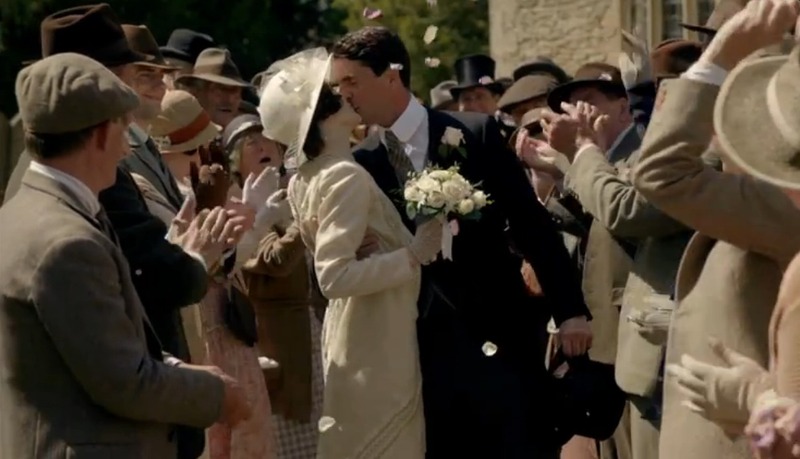 Downton is saved!!! All the worrying and handwringing and firing of servants could now be put on hold because their Savior had arrived. In the form of Bertie Pelham. 2. Marital bliss? Or irritability? Robert, Cora, and Rosamund decide to help poor Mrs. Patmore clear her name—it’s as easy as having tea!—but Carson is, of course, concerned. How will this reflect on the fam? Mrs. Hughes argues that they are all adults and can make up their own minds about whether to visit a House of Ill Repute or not. Carson then deals a blow that, I’ll admit, blew me right off the sofa. Later, though, Mrs. Hughes puts everything into perspective for us when she plainly tells Mr. Carson, “You’re such an old curmudgeon.” Carson wonders if she’s gone off him, but she puts him at ease. Illustrating that this is often the way it is in marriage. What a terrible, terrible thing to do to your sister, Mary. I just can’t get over the sadness of Edith’s breakup with Bertie. And I couldn’t help noticing that Edith’s contrition only made her more beautiful as she bade farewell to the second love of her life. She sure gets the last word with her sister, though, doesn’t she? But first, Mary and Tom have it out. I absolutely loved that scene in the agent’s office when Tom confronts Mary. She deserved every single word of it. Tom: How many lives are you going to wreck, just to smother your own misery? Mary: I refuse to listen. But Edith’s having none of it. And we finally get to my favorite line of the night, if not the entire show, ever. Thanks for putting into words what we were all thinking, Edith. Violet believes in it. Who knew? Yes, Granny returns to try to set things right between her granddaughters. She knows full well their own mother is sitting on the sofa in the library reading a magazine, sipping champagne, and is entirely incapable of handling any emotional mess between her daughters. Cora, you are an embarrassment to motherhood. Didn’t you just love the sweet scene between Violet and Mary in Mary’s bedroom? Violet has huffed and puffed her way up the stairs (“Oh good! Climbing all those stairs wasn’t wasted!”) to confront and console her favorite granddaughter. So Mary’s not so bad after all, Granny? And then we get a glimpse into Violet’s heart when she consoles Mary. So true, Violet. But I’m not sure I would have gone so easy on Mary. 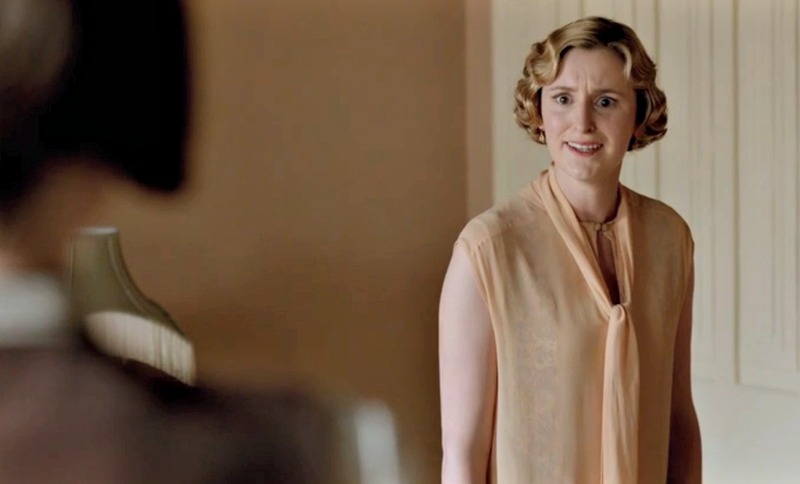 She did, after all, ruin Edith’s life. Again. But Violet gives Mary some sage advice in the end. It must have been love that finally got to Mary because shortly after that she heads to Matthew’s grave to have a chat. I must be going soft on Mary too, because that scene made me cry buckets. And then Isobel shows up and shows such kindness to Mary that I cried some more. So Matthew has forgiven Mary. And Isobel has forgiven Mary. 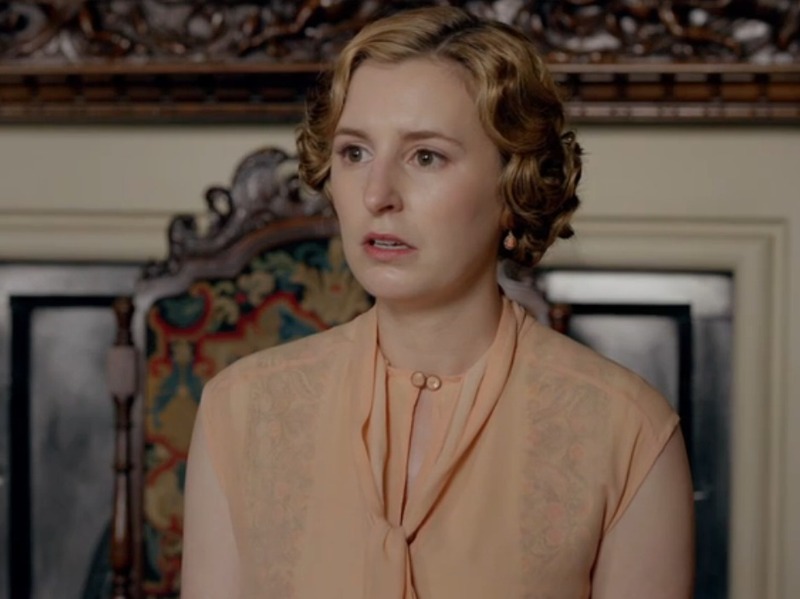 But will Edith ever forgive Mary? Is Mary actually sorry now? She seems to be, but Edith totally gets her sister. She knows that Mary is only being nice because she’s happy again, and she tells Mary so. 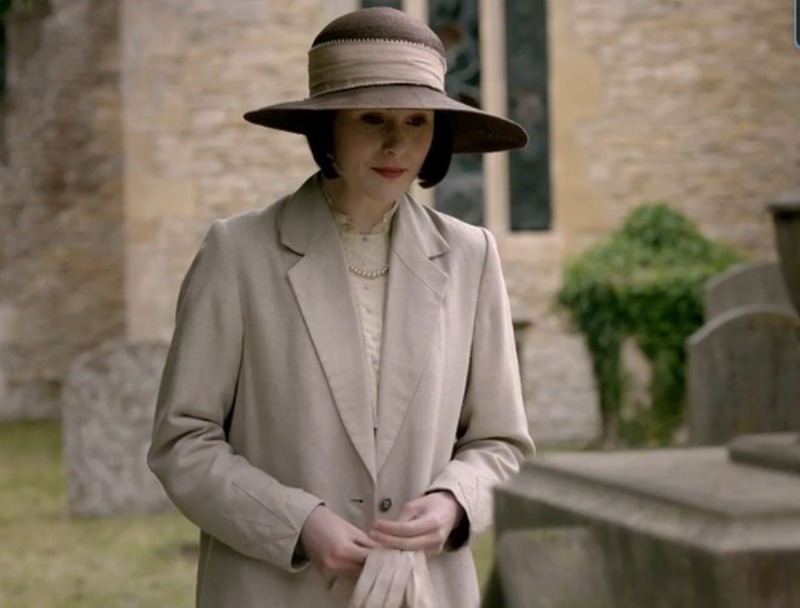 Truthfully, I think Edith has grown so much more as a character than Mary has. Edith shows true insight into her sister’s character, and yet she also shows maturity in coming back for Mary’s wedding. And sometimes that’s the best we can do. We forgive in our own way and we move on. So what did you think of this episode? What did I miss? Let's chat in the comments! Agreed...what a roller-coaster! Didn't help that our recording cut off with ten minutes remaining...very thankful PBS rebroadcasts. Your reviews have been wonderful--I anticipate them almost as much as each new episode! Thanks for making DA a communal experience! Awww. That's so nice, Terri. Thank you for reading! Thank you for detailing the conversation between Violet and Mary. 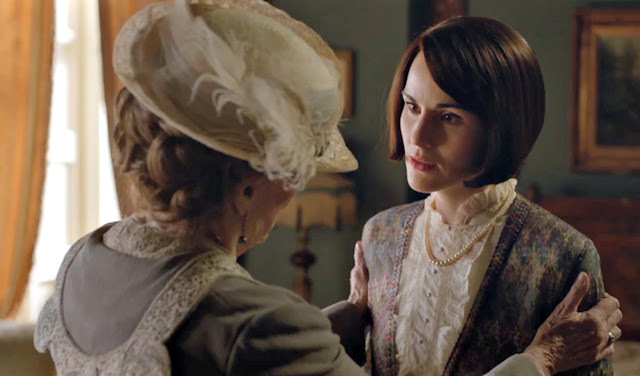 There is a reason Violet is the revered matriarch of this clan--sometimes she holds that position by being snarky and incisively witty, then there are times like this quiet moment where she surgically pokes at Mary's heart and gently redirects her. Violet must truly believe so much in love--what she did in this scene could only be accomplished with great love. Thank you for another wonderful recap! Love your insight, Anon! I think you're right--Violet must believe in love. Great re-cap! My husband and I are going to miss DA and its cast of characters! It's one of the few TV shows we both enjoy.